Often confused for just another shade of purple, lavender is its own distinct family of colors. While it naturally shares certain historical, spiritual, and psychological associations with the former, lavender certainly possesses a unique heritage of symbolism and meaning. The color family of lavender encompasses a wide variety of shades and hues, from the pale, pinkish tone of lavender blush to the cold undertones of lavender grey. Just as the flower that bears its name, the color lavender is associated with the youthful, untamed growth found in nature during springtime. This psychological association is confirmed by the color’s historical use within the Christian faith as a symbol of Easter. In that sense, lavender represents the part of the psyche that, untouched by the weary and troubles of years, retains the vigor and vitality of youth. This encompasses such emotions and mental thought processes imagination, creativity, and because of its association with springtime, the optimistic beginning of new stages in life. Like its purple cousin, lavender is associated to a degree with patriarchal leadership, though this is balanced out by the color’s mixed connections to both femininity and decadence. Because of this, lavender is in the unique position of invoking masculine, feminine, dynamic, and restful states of mind depending on the current psychological perspective and temper of the viewer. Lavender’s masculine qualities are tied to its association with kingship, as the rarity of the color lavender in nature means naturally derived dyes were reserved for the elite throughout history. This is balanced by the color’s association with spring time, a period of fecundity and therefore the feminine aspects of the psyche. Likewise, lavender’s association with masculine kingship means it can evoke an ordered mental state, while its association with the wild growth in nature during springtime with a chaotically productive psychological state. One key part of this mental association is lavender’s connection to grapes, and thus to wine. The liberating intoxication of wine stands juxtaposed to the mind’s association of lavender with ordered kingship, allowing for these seemingly incongruous perspectives to exist simultaneously. For some minds, the psychological implications of the color lavender are inseparable from the flower of the same name. The ancient Hebrews ascribed holiness to lavender, using it as a key component of ritual anointing oil, a fact attested to in the biblical Song of Solomon. Ancient Romans valued it so much that a pound of the plant sold for as much as a farmer’s entire monthly wages. 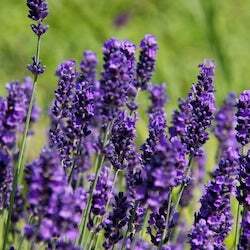 Lavender has a number of medicinal properties, from aromatherapy to value as an antiseptic. Because of this, along with its religious connotations, the color is mentally associated with healing, relaxation, cleanliness, and purity. The lavender color encourages calmness and tranquility of mind and is useful for both self-reflection and invoking a relaxed, meditative state. This correlation is strongly reinforced by the color’s patron plant being favored heavily in aromatherapy and it stands to reason that using both in conjunction provokes a more profound effect.